Hello dear readers!! How are the preparations for Diwali going on. I am almost done, I designed and sewed lots of cushions, painted and decorated few pots, my Indian art gallery wall is ready and I am beaming with pride, house is clean and sparkling, furnishings have been changed, all my silverwares are out and shining, fairy lights are being given their right places and my home is basking in the warmth of the lights. I am sure you are all set for the biggest festival. But let 3D bring some more light and happiness around your home. I am here with the easiest DIY for Diwali. My last year's Diwali DIY on my YouTube channel is about to cross 2 lakh views (Click here to watch). This year's Diwali DIY is quite an easy craft. 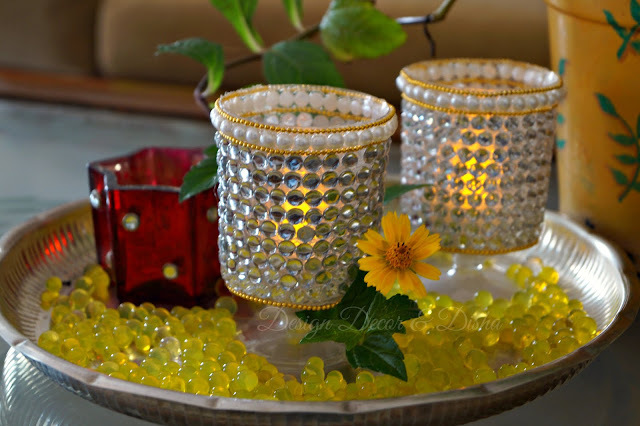 So without much ado here is a tutorial for you to make beautiful tealight holders. 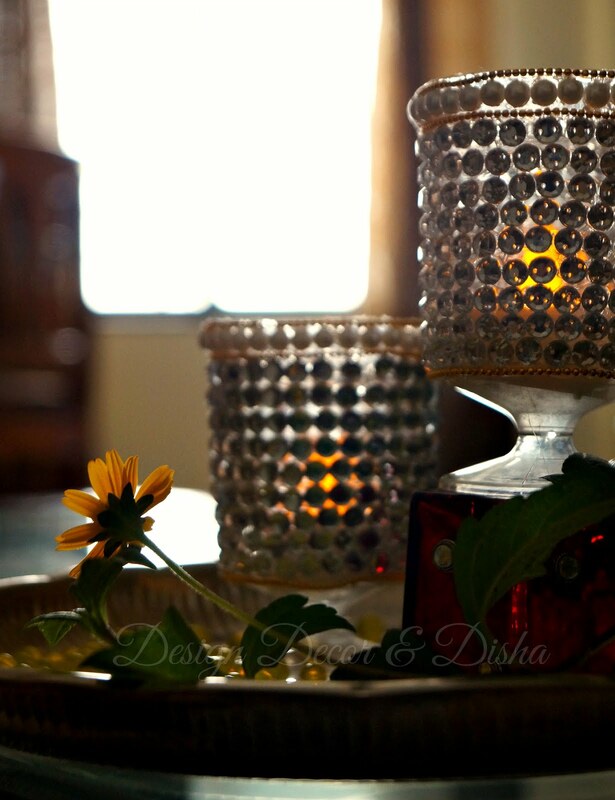 Below is the video tutorial of DIY tealight holders. I love vlogging (video blogging) as much as I love blogging. Hence I have decided I would be vlogging more often now. Watch the video below and let me know your views. If you have any query please leave a comment and will try my best to answer it. Here are some images how I styled these tealight holders. In a decorative tray or platter place some colorful beads or water gel beads. You can fill the tray with petals also for perfect festive ambiance. 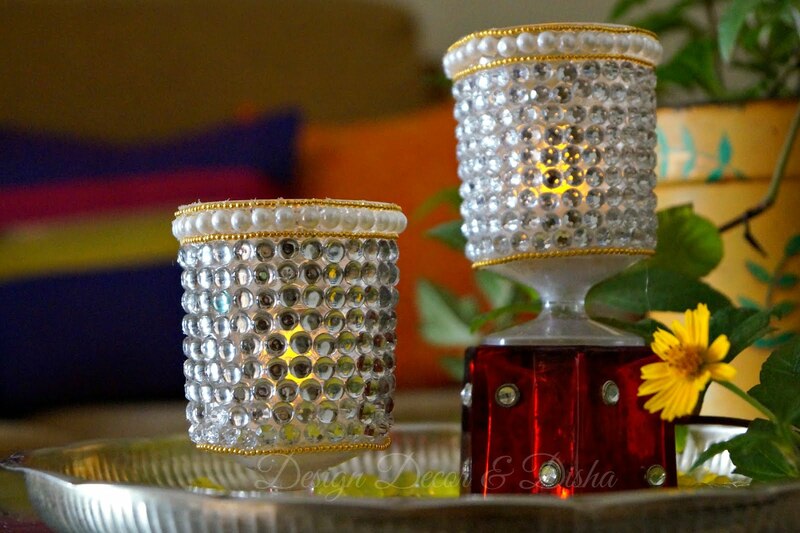 Now place the tealight holders and admire the beauty because handmade is more precious than the stuff you buy. You can keep one tealight holder on a wooden box or any colorful glass votive to add some dimension. Hope you enjoyed watching the video and will be giving it a try. In my next post, I'll be sharing some sentiments on how my home inspires me. 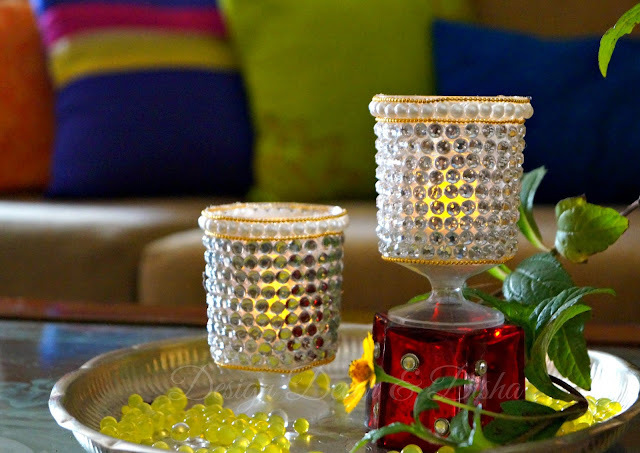 For more posts on Diwali decor and DIY, click the links below. P.S. Recently I found out that many images from my blog are being stolen. Some people even removed the watermark and posted images from my blog blatantly without giving proper credits and one person used the image from my blog as her brand logo without my knowledge hence the watermark is bigger and less faded from now on. Please seek my permission if you want to use any image from my blog. Thank You!! Stay tuned and have a very wonderful and safe Diwali! !